I don’t know about you, but I’m reallly ready for spring. I’ve been feeling a little cooped up, so I decided to make a new pillow to brighten my spirits. Contrary to what Anthony may think, I’m not sure I can ever have enough pillows. This DIY Home Sweet Home Pillow, well it’s one of my very favorites, just like my DIY rosette pillow. I did the exact same thing as the opposite side, and was I was done, I let the paint dry for a few hours. If you didn’t want to sew it with a machine, you could easily hand stitch it closed, but I find the machine much quicker! It’s such a happy pillow… and the wording is so true! This pillow… it might just complete me! Home Sweet Home… that just about sums up how I feel! I do not own a Silhouette nor have I used one and I am confused as to how freezer paper adheres to fabric with an iron. Can you explain this to me? Darling pillow! THANK YOU so much, Karen! Freezer paper adheres really well to fabric! It has a waxy side that sticks to fabric when it’s heated with an iron. However, wax paper will not work. Freezer paper has a paper top and a wax backing. Somehow the wax heats up and molds to the fabric. The Silhouette just makes it much easier to cut than doing it by hand with a razor blade. Love it Shayna, beautiful job. hi shayn! i wish i have that silhouette and sewing machine. God knows how i love pillows. i don’t know if this silhouette machine is available in our country. If it is, i bet its super expensive. Huh!! any recommendation? Hi Arnie! The silhouette is amazing and it makes quick work of these projects! Here’s the link to Silhouette: http://www.silhouetteamerica.com/select-a-silhouette. You could also check out amazon.com too! Omgness…I’m on it! (((Big hugs))) thank u beautiful! It turned out great! Learning to make pillows (all kinds) is on my list of things to do in 2014. Thanks for the easy tutorial! I just got a silhouette for my birthday and I have not had a chance to use it. Can you point me to any great resources on getting the hang of using it? For instance designing your own graphics or cutting freezer paper? Hi Hannah! You will love your Silhouette! I had a bit of trouble using mine in the beginning, but it’s really all about trial and error. I would recommend cutting on freezer paper or thick card stock before you start cutting on vinyl, which is more expensive and a little trickier to use. The silhouette design studio is very user friendly and quite similar to Microsoft Word. I have noticed that even though the silhouette can cut any font on your computer, it doesn’t love the tiny script fonts. It will still cut them, but they’re not as clean of a cut. To get a grasp of it, maybe cut a stencil, much like this one: https://www.thewoodgraincottage.com/2014/01/29/wood-slab-sign/. Also, your mat will be super sticky for a while. It makes it a bit hard to lift off paper, vinyl, freezer paper, etc. It will eventually lose a bit of its stickiness, which is a good thing! This was a very well done and complete tutorial ! Thanks ! I believe I will give it a try ! AWESOME JOB ! Hi. This is such an adorable pillow! 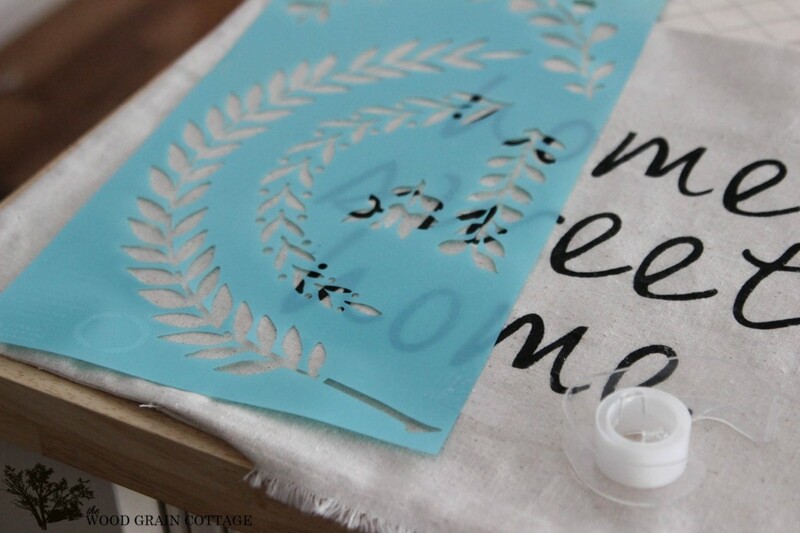 Can I ask when you purchased the stencil (from Michaels) and some specifics about it (brand, design name etc)? Thanks! 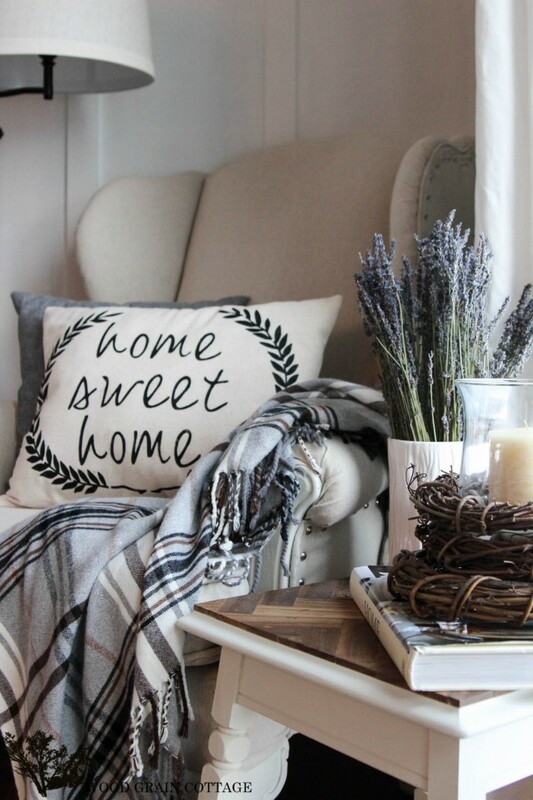 What font did you use for this pillow? Did you buy it on silhouette or up load your own? I love this! Thank you so much! I don’t remember the exact font, but Lucidia handwriting is close. It was a font that I had on my old computer, but it crashed. Sorry that’s not more helpful! Beautiful job! The steps were so easy to follow and the images beautifully done! Thank you! Had NO IDEA that Freezer paper would do this! Thanks for sharing – I LOVE your blog and all your great ideas!!! Why did you use paint instead of cutting the leaves with the Silhouette and ironing them on too? I love this!!! Would you ever make one to sell?! I’d be very interested!!! Thank you! !